Mookaite is a visually striking gemstone found close to the Kennedy Ranges near Gascoyne Junction, a small town east of Carnarvon in Western Australia. The name Mookaite is derived from its location at Mooka Creek, on Mooka Station, once a large sheep grazing property. Mookaite is one of Australia’s best known gemstones due to its amazing combination of colour, pattern and hardness. Vivid red, white, yellow and purple shades make Mookaite a highly sort after, world class stone. Mookaite has an interesting origin. The area in which it is found was once part of the ocean that had long since receded, leaving an inland sea. As this inland sea evaporated, billions of tiny organisms known as Radiolarian were left behind in beds up to several metres thick. These calcareous skeletal remains absorbed iron rich minerals and silica from the sea and underground vents and springs, to form Windalia Radiolarite, a hard, fine grain chert, covering an area of thousands of square kilometres. The higher concentrations of iron and silica at the Mooka Station deposits, has produced this unique example of Radiolarite we know as Mookaite. This formation is from the Early Cretaceous period, or around 120 million years old. 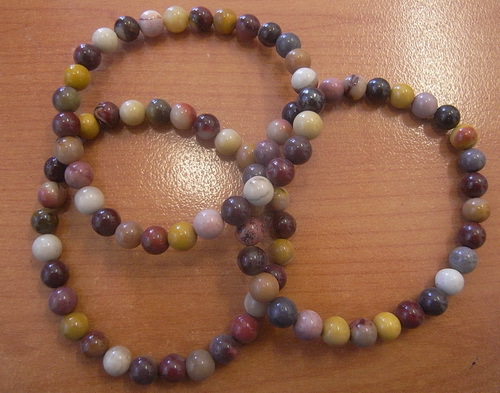 Mookaite is fashioned into many items such as jewellery, carvings and ornaments.